- Gold stocks’ powerful surge in 2016 is merely a tiny baby bull. While the magnitude of gold stocks’ gains sounds excessive in isolation, they’re anything but. - Gold stocks’ big run this year is totally justified considering late 2015’s epic bearishness, extreme secular lows, and truly fundamentally-absurd gold-stock price levels. - For all their sound and fury, gold stocks haven’t even regained year-ago levels. This is really bullish, since tiny baby bulls gradually grow into large mature ones. Gold stocks have radically outperformed every other sector in the stock markets this year, blasting higher as investors flock back to gold. This powerful surge is spawning worries that gold stocks' new bull run is in danger of exhausting itself. But such fears are totally unfounded. A longer-term perspective reveals that gold stocks' baby bull market in 2016 remains tiny in the grand scheme. This new bull has barely begun. Successfully buying low and selling high to multiply wealth in the markets demands traders overcome their own innate greed and fear. These ever-present emotions are constantly warring in traders' minds, impairing their judgment. One consequence of heeding these dangerous emotions is the tyranny of the present. Traders naturally tend to overweight the present and forget the past, which leads to poor decisions. If gold stocks are considered over the past few months alone, it's easy to see why the magnitude of their run would be concerning. As of the middle of this week, the flagship HUI gold-stock index had rocketed 64.7% YTD compared to gold's +19.0% and the benchmark broad-market S&P 500's -0.8%! Any move of this magnitude reeks of severe overboughtness, and looks utterly unsustainable after rallying too far too fast. And that's not the worst of gold stocks' performance conundrum. Between mid-January and this week, the HUI had skyrocketed 81.9% higher to gold's +16.1% and the S&P 500's +7.8%! That's certainly an astounding 1.9-month run. Normally when any price soars so far so fast, a sharp downside reckoning is inevitable and imminent. But gold stocks' situation leading into this incredible bull run was anything but typical. And gaining perspective on that bigger picture is crucial to suppressing the greed and fear that always cloud traders' judgment. While gold stocks' monster bull run looks excessive in the context of the last few months, it remains surprisingly little when framed by past years' price action. The gold stocks' new bull market is still a tiny baby, with vast sentimental, technical, and fundamental room left to mature into a juggernaut. For all gold stocks' sound and fury this year, they've actually regained very little ground. This first chart looks at gold-stock price action as rendered by the HUI since early 2015. 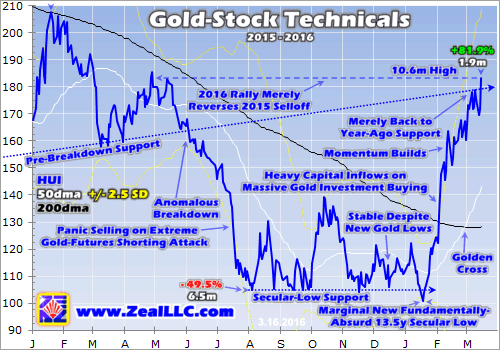 All gold stocks have managed to accomplish technically so far this year is to reverse last year's anomalous selloff. Just this week, the HUI finally clawed back to where it would've been if epically-bearish sentiment hadn't crushed it in 2015. Between autumn 2014 and spring 2015, the gold stocks were grinding higher on balance above pre-breakdown support. From October 2014 to May 2015, the HUI averaged 177.1 compared to gold's own average of $1207 over that span. But in early June, gold stocks started breaking down and this support line failed. And since the gold stocks weren't following gold lower, that breakdown looked seriously anomalous. Last June, the HUI plunged 10.2% to gold's mere 1.5% drop. That's extreme 7.0x leverage to gold, far beyond the typical 2x to 3x exhibited by gold stocks. After intensely studying this June breakdown on a day-by-day basis in real-time as it happened, I think it was purely psychological. The S&P 500 had just carved a dazzling new all-time record close in late May, extending its cyclical bull to +215.0% over 6.2 years. With the stock markets seeming to do nothing but rally indefinitely thanks to the Fed's extreme easing, investors felt no need to diversify their portfolios with gold. American stock investors were continuing to liquidate their shares in the SPDR Gold Trust ETF (NYSEARCA:GLD), forcing its holdings down to new bear lows. And with gold looking doomed to grind lower indefinitely, there was no incentive to buy gold miners dependent on gold for profits. The heavy gold-stock selling accelerated into a free fall in the heart of the summer doldrums in mid-July. Late one lazy Sunday evening, a futures speculator slammed through an enormous 24k-contract gold-futures short sale. This trade was brazenly timed and executed to run stops on the long side of the hyper-leveraged gold-futures market. It was a manipulation intended to shatter gold's years-old major support. And this record gold-futures shorting attack succeeded, blasting gold $48 lower to $1086 within a single minute! Back then there was a universal-but-false perception that the gold-mining industry just couldn't produce gold at less than $1200 per ounce. So with the gold miners believed to be seriously impaired fundamentally, the HUI plunged to a brutal 13.0-year secular low in early August. Gold stocks were despised. But seeing the HUI around 105 was fundamentally absurd, as I pointed out at the time. During Q2'15, the last quarter before the bottom fell out for gold stocks, the elite miners of the leading Market Vectors Gold Miners ETF (NYSEARCA:GDX) were producing gold at all-in sustaining costs of just $895 per ounce. So they were actually quite profitable even at $1050 gold, this industry never faced the existential threat that most traders assumed. The gold miners' stocks were trading at prices last seen in July 2002 when gold was still under $305 and had yet to exceed $329 in its young secular bull. Yet they were earning operating profits approaching $200 per ounce! So even as gold drifted lower into the Fed's first rate hike in 9.5 years in mid-December, the gold stocks stabilized with strong support at that HUI 105 level. That was a key clue a major trend reversal loomed. During the final months of 2015, gold was crushed to a major new 6.1-year secular low on the universal belief that Fed rate hikes would devastate zero-yielding gold. Yet historical Fed-rate-hike cycles proved that gold thrives in those very environments, especially when they are gradual and gold enters them down near relatively-low prices. The gold stocks were so oversold that they didn't plunge on gold's deep new low. So this sector ended 2015 utterly hated, limping along near 13-year secular lows. Virtually no one was bullish on gold stocks, they were either utterly ignored or viciously ridiculed. But I published an essay on December 31st explaining why gold was on the verge of a major new upleg in 2016! With gold trading near $1060 and the HUI at 111.2, I explained why "gold stocks should be 2016's top-performing sector." Man, you should've seen the blizzard of hate mail I got on that contrary fundamental call! The great majority of traders can't look beyond the past few months, they can't perceive the bigger picture driving major trend changes. And instead of making the effort to study and understand, they find it easier to bury their heads in the sand. They foolishly extrapolate the present into infinity, and mock anyone who doesn't. Indeed the early-2016 gold and gold-stock action looked promising, with investors starting to nibble after years of exile. But unfortunately there was one final exam for long-suffering contrarians, the gold stocks plunged to a marginal new 13.5-year secular low in mid-January. Weathering this proved very difficult psychologically. But as I warned that very week, gold-stock prices were still fundamentally absurd. It's impossible to understand 2016's skyrocketing gold stocks without this crucial context leading into it. If gold stocks had rocketed 80% higher in 2 months to new record highs in sheer euphoria following a multi-year bull market, a collapse would indeed be imminent. But the same extraordinary move coming off the worst gold-stock levels in well over a decade when this sector was loathed is a very different beast. All gold stocks have accomplished technically in 2016 is reversing the anomalous selloff of 2015 that started in early June. As of the middle of this week, the HUI was merely back up to a 10.6-month high. It had simply regained pre-breakdown support from late 2014 and early 2015, and was trading at levels seen in April. If last summer's anomalous breakdown hadn't happened, today's 180s HUI would induce yawns. So despite gold stocks' incredible surge so far this year, this sector remains far from overextended. An index merely regaining an already-low level after gapping down is nothing to fear technically. It does not show overboughtness on anything beyond a very myopic weeks-long perspective. The tiny baby bull market in gold stocks remains in its infant stage, with the vast majority of its gains still yet to come! Overwhelming evidence for this thesis exists in the sentimental, technical, and fundamental realms. Starting with sentiment, gold-stock psychology remains incredibly bearish today despite 2016's powerful bull run. It is riddled with doubt and disbelief, an early-bull state in sharp contrast to the widespread euphoria ubiquitous in mature late-stage bulls. It's actually shocking how pessimistic traders remain on gold stocks! Sentiment is ethereal and ephemeral, impossible to quantify empirically. The only way to get a read on it is to intensely study the markets. And I'm very blessed to have an exceptional opportunity to do that. All I do at work all day every day is watch the markets, research the markets, write about the markets, and trade the markets. Being a financial-newsletter writer is a fantastic job for a student of the markets and speculator! And having been deeply immersed in the markets nearly every single trading day for over 16 years now, I've experienced a great deal. All those years of study have helped me really understand the perpetual flow and ebb of prevailing sentiment. Today traders aren't the least-bit excited about gold stocks yet, as is evident in mainstream analysts' reports, financial-television interviews, and general financial media. Gold's sharp surge so far this year is still seen as a temporary anomaly driven by safe-haven buying in response to the early-2016 stock-market selloffs. The dominating expectation is that gold's massive new investment buying is going to soon reverse into selling as stock markets stabilize. And therefore 2016's huge surge in gold stocks isn't sustainable. They are widely expected to soon roll over and drop again. As a long-time newsletter writer, I have access to another sentiment stream few do in the form of e-mail feedback. I've been researching and trading gold stocks full-time since 2000, and during that span I've seen lots of gold-stock rallies. Usually when gold stocks climb notably, I see a strong surge in bullish e-mails from retail investors reflecting their excitement. So far in 2016, that telltale feedback spike hasn't happened. Amazingly, the level of enthusiasm for gold stocks in mid-March doesn't feel all that much different from mid-January as they plunged to new secular lows! The vast majority of investors are either unaware of this sector or ignoring it, despite it trouncing all other sectors in 2016. And even among the contrarians, skepticism and doubt remain incredibly high. Few dare to believe that this new gold-stock bull is the real deal. Not only is the gold-stock psychology still very much baby-bull-like today, so are the technicals as well as the fundamentals. 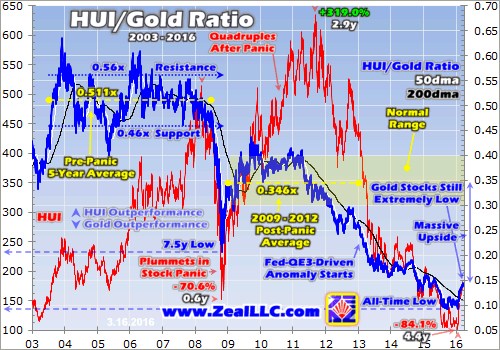 This next chart looks at the HUI/Gold Ratio, which simply divides the daily close in the HUI by the daily close in gold. Since the gold price drives gold-mining profits, which ultimately drive gold-stock price levels, this HGR offers an excellent fundamental proxy on prevailing gold-stock price levels. On the technical front, the gold stocks have barely budged from their extreme secular lows. The red line is the HUI, and once again it's only regained levels from not even a year ago. In 2012, the last normal year before the Fed's unprecedented open-ended QE3 started radically distorting the markets, the HUI averaged 465. Between 2009 and 2012, after the stock panic but before QE3, the HUI averaged 462. So technically, a 180s HUI is extremely low by all standards. Before late 2014, the gold stocks had not consistently traded at such low prices since 2003. And back then gold averaged $364, less than a third of 2015's $1159. Despite 2016's sharp gold-stock rally, gold-stock price levels are still horrendously low compared to precedent. Heck, on a long-term chart 2016's gold-stock rally is so unremarkable it'd be easy to miss! And the fundamental case for gold stocks still being priced far too low is way stronger than the technical one. Gold-mining stocks are essentially leveraged plays on the price of gold. Mining costs are largely fixed in the mine-planning stage, so changes in gold's price flow directly through to the bottom line. The prevailing gold price has a direct relationship with gold-mining profitability, and hence gold-stock price levels. I explained this critical fundamental relationship in much depth 5 weeks ago in an essay on gold-stock upside targets. So please read that if you want all the background to fully understand the importance of the HUI/Gold Ratio. But for our purposes today, realize several truths revealed by this HGR chart. The HGR has been falling on balance for years, it's barely off an all-time low, and it's long overdue to mean revert higher. Financial markets are forever cyclical, and gold stocks are no exception. Sometimes they outperform gold as evidenced by a rising HGR, and sometimes they underperform and the HGR falls. With the exception of 2009's mighty post-stock-panic gold-stock bull, the HGR had fallen on balance for an incredible 8 years as of late 2015! Gold stocks can't underperform the metal that drives their profits forever. And with gold-stock prices coming off an all-time low relative to gold in late September, which was just hit again in mid-January, the HGR has nowhere to go but up. After any major fundamental relationship between two prices hits exceptional extremes, a mean reversion is always inevitable. While 2016 has seen enough gold-stock outperformance to push the HGR 56% higher as of this week, it remains super-low. The HGR has recovered from 0.093x to 0.145x, but that is still vastly below long-term averages. Before 2008's once-in-a-century stock panic, the HGR averaged 0.511x for a secular 5-year span. During the normal post-panic years from 2009 to 2012 sandwiched between the stock panic and QE3 ramping to full steam in early 2013, the HGR averaged 0.346x. Normal levels are radically higher than today's levels. And at $1250 gold, a 0.346x post-panic normal HGR implies the HUI should be trading up near 433 on a fundamental basis! That's another 2.4x higher from this week's levels. As discussed in essays during the past month, the elite major gold miners of GDX and gold juniors of the Market Vectors Junior Gold Miners ETF (GDXJ) were mining gold at low average all-in sustaining costs of $836 per ounce and $812 per ounce even in gold's darkest quarter in Q4. So even at $1250 gold, this industry is earning profits exceeding $400 per ounce! So it continues to be fundamentally absurd to see gold stocks still priced at levels from 2003 even after catapulting higher in 2016. This year's powerful gold-stock surge has barely put a dent in this sector's long-overdue mean reversion higher for fundamental reasons. This wildly-undervalued sector continues to have massive upside. While a monster 80% gain in 2 months certainly sounds excessive, coming out of gold stocks' crazy-anomalous situation of epically-bearish sentiment, 13+ year secular lows, and radical undervaluation, it is actually completely justified if not modest. Far from being over, this tiny baby gold-stock bull is only just getting started. The great majority of the mean-reversion gains in this devastated sector are still yet to come. You can certainly ride this powerful new gold-stock bull in that leading GDX gold-stock ETF, which will mirror the HUI's gains. But those can be amplified with a handpicked portfolio of the elite gold miners with the best fundamentals. Individual gold stocks' performances in this bull will shake out like a classic bell curve, so the ultimate strategy is to avoid left-end underperformers while loading up on right-end winners. The bottom line is gold stocks' powerful surge in 2016 is merely a tiny baby bull. While the magnitude of gold stocks' gains sounds excessive in isolation, they're anything but. Gold stocks' big run this year is totally justified considering late 2015's epic bearishness, extreme secular lows, and truly fundamentally-absurd gold-stock price levels. For all their sound and fury, gold stocks haven't even regained year-ago levels. This is really bullish, since tiny baby bulls gradually grow into large mature ones. Coming out of such unbelievable extremes, the inevitable mean reversion higher in gold stocks is literally going to take years to unfold. So the opportunities to multiply wealth in this new gold-stock bull are only just beginning. As always, the contrarians who buy in the earliest are going to enjoy the greatest gains as others follow them in.